Using a combination of CIAO tools, we extract source and optionally background spectra for a pointlike source. The spectrum is grouped, if desired. The appropriate Response Matrix Files (RMFs) and Ancillary Response Files (ARFs) are created. The specextract script automates these steps for extended and pointlike sources. To generate source and, optionally, background spectra of a pointlike source and build the proper RMFs and ARFs. The Extract Spectrum and Response Files for an Extended Source thread handles the extended source case. Point like sources detected further away from the optical axis which are significantly blurred by the PSF should also follow the extended source thread. 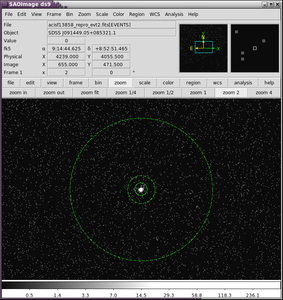 Among other things, the srcflux tool runs specextract as described in this thread. Last Update: 8 Dec 2016 - The thread has been almost entirely re-written using a different example source. Most of the basic processing steps are the same. The background extraction section has been reworked to clarify that it is optional, but if performed should use a weighted ARF. Users are strongly encouraged to reprocess data retrieved from the archive using the chandra_repro script to apply the latest calibrations consistent with the current versions of CIAO and the CALDB. A circular region is used for the on-axis point source and an annulus (drawn with a dashed line) is used for the optional background region. A circular region is used for the source. A co-located, disjoint annulus is used for the background. Generally, the background should be extracted from a region near the source. The source and background regions are saved into separate region files: src.reg and bkg.reg. These can be saved in either CIAO or ds9 format in either physical or WCS coordinates. arfcorr: to apply an energy-dependent point-source aperture correction to the source ARF file. The weight parameter is set to "no" to tell the script to make a pointlike ARF and the correctpsf parameter is set to "yes" so that arfcorr will be run to correct the ARF. These must be changed since the default behavior is weight=yes and correctpsf=no. Aspect solution file pcadf456520092N001_asol1.fits found. Updating header of SDSSJ091449.05+085321.pi with RESPFILE and ANCRFILE keywords. Updating header of SDSSJ091449.05+085321_grp.pi with RESPFILE and ANCRFILE keywords. Updating header of SDSSJ091449.05+085321_bkg.pi with RESPFILE and ANCRFILE keywords. Updating header of SDSSJ091449.05+085321.pi with BACKFILE keyword. Updating header of SDSSJ091449.05+085321_grp.pi with BACKFILE keyword. The lines in bold indicate the ancillary files that have been picked up automatically. The contents of the parameter file may be checked with plist specextract. The above call created an ARF and RMF for the background region; if you only intend to subtract the background, rather than fitting it, you do not need these responses and can save some time by setting bkgresp=no when running specextract. If responses are created for the background region, they should use the weight=yes and weight_rmf=yes settings used to create the source responses. Read the analysis caveats before proceeding to fitting the spectrum. This completes this thread. The next sections shows the individual steps used by spexectract. The source and background extractions are shown separately. unix% pset dmextract infile="acisf13858_repro_evt2.fits[sky=region(src.reg)][bin pi]"
Badpixel and bad column information is stored the bpix1.fits file. This file is used by several tools and is accessed via the ardlib.par parameter file. When working with single datasets chandra_repro will, by default, automatically setup the ardlib.par file with the correct bad pixel file. However, if other observations have been recalibrated, then the ardlib.par file may not be pointing to the correct files. More details about this process can be found in the Setting the Observation-specific Bad Pixel Files thread. Since the calibration varies across the chips, we need	to locate the centroid (in chip coordinates) of the source. This information is needed to create the ARFs, as well as to select which FEF (FITS Embedded Function) to use in calculating the RMFs with mkrmf. You can check the parameter files for these commands with plist dmstat and plist dmcoords. The centroid of the source region is (x,y)=(4104.477,4115.815) in sky coordinates which is located on ACIS-7, aka ACIS-S3, at (chipx,chipy)=(207,517). The observation used in this thread was taken at the -120 C focal plane temperature and the source is on ACIS-7, a back-illuminated chip. Therefore, it is possible to use mkacisrmf to create the RMF file. The syntax for both mkacisrmf and mkrmf are given in this section. The only datasets which require using mkrmf are datasets taken at warm focal plane temperatures (above -110C) which occurred early in the mission (in 1999 and very early in 2000). Single region, #1233 , processed. If you use mkacisrmf to create the RMFs, you can now continue to the Calculate the ARFs step. You can check the parameter file that was used with plist acis_fef_lookup. The syntax ")acis_fef_lookup.outfile" is a form of parameter-redirection that allows one parameter file to use the value from another parameter file. More information can be found in the parameter file help file. The aspect histogram uses the information about the Good Time Intervals (GTI) from the event file. Since there are multiple GTIs, one set for each CCD_ID, we need to filter the event file with the correct CCD_ID filter to select the correct GTI. You can check the parameter file that was used with plist asphist. There may sometimes be more than one aspect solution file (pcad_asol1.fits) for an observation. All the files must be input to the infile parameter, either as a list or as a stack. The sourcepixelx and sourcepixely were found in the Locate Centroids step. The energy grid (engrid) must be the same as that used in the RMF. To obtain an accurate ARF at the very edge of a CCD, subarray or window, it is necessary to include the mask file (msk1.fits). Please see the Watch Out page for a discussion of the pbkfile parameter file change. mkarf can also be used to create the ARF for the 0th order grating response. Users need to specify the grating parameter to match their observation. You can check the parameter file that was used with plist mkarf. arfcorr calculates the energy-dependent point-source aperture correction (PSF fraction) for the source and applies the correction to the ARF file. The (x,y) position used when running mkarf is input to arfcorr, as is the extraction region used for the source spectrum. An input image is required to set the size and scale of the PSF image that will be generated. unix% pset arfcorr infile="acisf13858_repro_evt2.fits[sky=region(src.reg)][bin sky]"
an additional column, "PSF_FRAC", lists the fraction of PSF counts within the input region at each energy (i.e., the ECF at each energy). the "SPECRESP" column values have been multiplied by the PSF_FRAC value, resulting in column values of effective area scaled by the ECF. You can check the parameter file that was used with plist arfcorr. Finally, update the appropriate header keywords in the both the ungrouped and grouped source PHA files. This allows modeling and fitting applications such as sherpa to automatically locate and load the correct response files when the data set are read in. Earlier versions of this thread created response files using the same tools/logic as for a point source. However, given that the background is generally extracted over a large region, the background responses should be created using the same steps as for an extended source. 1. Is background spectrum necessary? Before extracting the background spectrum and optionally creating background response files, users should consider if that is really necessary for their specific analysis. For the on-axis point-source case covered by this thread, the source region is expected to be small. Given the Chandra background count rates, the expected number of background counts in that small region is often going to be negligible. If the counts in the source region is large, then it is often the case that the background can simply be ignored. Similarly, if the counts in the source region are low, then the source error bars may be large enough such that including the background or omitting it may yield statistically indistinguishable results. The only way to tell whether the background is important or not may be to do the analysis both ways. The next question is then whether the background response files are needed. If the analysis approach is to simply subtract the background (properly scaled for area and exposure), then there is no need to create background response files. When subtracting, the underlying assumption is that the events in the background region have the same response as the background events in the source region. Therefore the events in the background region and the background events in the source region share the same response files. When modeling and fitting and using subtract, the background response files are ignored. If instead the analysis will model the background, possibly simultaneously with the source, then the background responses may be necessary. In fact depending on the complexity of the background model both the source and background responses may be necessary. The background spectrum is extracted in a similar way as the source spectrum, just using the background region. Earlier versions of this thread suggested using mkarf. Given the large regions typically used for background extraction, the background should be considered as an extended source, rather than as a point source. The largest difference will be in the computation of the ARF. The point-source assumptions when badpixels, columns, and chip-edges are applied could cause the mkarf to overestimate the effective area. This thread now shows how to create weighted responses for the background region. This step uses the aspect histogram, asp7.hist, from the source spectrum extraction part of this thread. unix% pset sky2tdet infile="acisf13858_repro_evt2.fits[sky=region(bkg.reg)][energy=300:2000][bin sky]"
For very large background regions, this can take a very long time to complete. Users can adjust the sky2tdet bin parameter; larger values will run faster but the fidelity of the ARF can be degraded. As discussed above, most users will have data that is calibrated with the mkacisrmf tool. However, some will need to use the mkrmf tool to compute the RMF. Both are shown here form completeness. unix% pset mkacisrmf wmap="acisf13858_repro_evt2.fits[sky=region(bkg.reg)][energy=300:2000][bin tdet=8]"
Users are encouraged to use TDET, Tiled Detector, coordinates to create responses. The coordinate transforms from detector coordinates, det, to a location on the chip requires using an average value for the location of the detector relative to the mirrors -- specifically the mean SIM offsets, DY_AVG, DZ_AVG, DTH_AVG. Early in the mission those values were small had small variations throughout an observation. However, as the mission progressed these values have grown large and can vary significantly from their mean values during an observation. The coordinate transformation from tdet to chip coordinates though are independent of the SIM. The background can be grouped independently from the source region. In the following example the data are grouped into 20-channel wide bins. Below is a simple example showing how the data are loaded into sherpa to perform a basic fit. This fit is just shown to illustrate the commands used; the models and results are not meant to be meaningful. For a more detailed example users can read the Introduction to Fitting PHA Spectra thread. In this thread we showed how to use specextract to extract the source spectrum for a point like source and how to extract the background spectrum. We then showed the individual steps that specextract does using dmextract, acis_fef_lookup, acis_set_ardlib, mkrmf, mkacisrmf, dmstat, dmcoords, mkarf, arfcorr, asphist, sky2tdet, mkwarf, dmgroup, and dmhedit. Finally, the data were loaded into sherpa and a simple fit was performed. quality = no               Should you use the FEF file (if no use mkacisrmf)? (centroid = yes)             Calculate centroid if image? (median = no)              Calculate median value? (sigma = yes)             Calculate the population standard deviation? (clip = no)              Calculate stats using sigma clipping? (weight = no)              Should response files be weighted? (correctpsf = yes)             Apply point source aperture correction to ARF? (binarfcorr = 1)               Detector pixel binnning factor for (arfcorr) to determine size and scale of PSF to derive aperture corrections at each energy step. 23 Jun 2005 CIAO 3.2.2 patch: new calibration for mkacisrmf is available; see the "Using Consistent Calibration: mkrmf vs mkacisrmf section"
31 Mar 2006 specextract use update added to Overview; title changed from "Extract ACIS Spectra for Pointlike Sources and Make RMFs and ARFs" to "Using psextract to Extract ACIS Spectra and Response Files for Pointlike Sources"
26 Feb 2007 psextract v4.0 and acis_fef_lookup v1.20: Dead area correction parameters added to the psextract.par file: pbkfile and dafile (added "ACIS dead area correction section"). Script prints a warning if RMF should be remade with mkacisrmf. Several other minor code changes that don't affect the output files (see the Script History page for details). 12 Apr 2011 updated for specextract changes in the 12 Apr scripts package release: the grating parameter in mkarf was not being set for zero-order grating data point source extraction (weight=no); bug fix - regions may be specified on the command line or in a file, i.e. "sky=circle(344,435,10)" vs. "sky=region(src.reg)". 15 Dec 2011 reviewed for CIAO 4.4: documentation on psextract has been removed since the script is no longer part of the scripts package. 30 May 2012 corrected typo in arfcorr command. 07 Aug 2013 Updated for the contributed scripts 4.5.4 release: the "ancillary" files - e.g. aspect solution and bad-pixel files - can now be picked up from information in the event file (in many cases). The psextract information has been removed. 10 Dec 2013 Review for CIAO 4.6. Updated with infor relating to the deprecation of the pbkfile parameters. Added note about early observation requiring reprocessing. 03 Apr 2014 Added information about background responses and how they are affected by the response weighting parameters. 22 Dec 2014 Review for CIAO 4.7; minor edits only. 08 Dec 2016 The thread has been almost entirely re-written using a different example source. Most of the basic processing steps are the same. The background extraction section has been reworked to clarify that it is optional, but if performed should use a weighted ARF.